Learn about the Brady BBP33-C 129961 Label Printer with Auto Cutter. Includes pricing, features, and frequently asked questions. The Brady BBP33-C 129961 Label Printer is a label printer that features automatic set-up and calibration, allowing you to print labels in four easy steps. The Brady BBP®33-C is used to create labels for a wide range of items in various industries. Pros: Fast printing, auto cut-off, no wastage, 5-year warranty. Bottomline: A sturdy and fast printing machine that prints up to 3,000 labels per day. 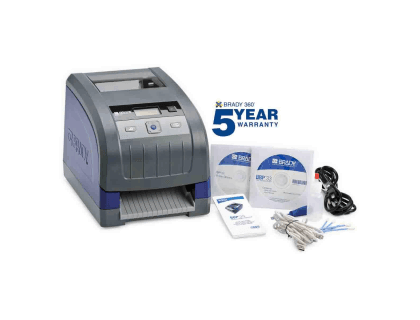 The Brady BBP33-C 129961 Label Printer with Auto Cutter retails for $1,350.00. PC-connect only facility & safety ID printer with no calibration set-up, no label waste and 20-second supply changeovers. Revolutionary ease of use makes it ideal for training multiple users and saving wasted time and wasted label cost. The BBP®33 Printer is a whole new way to make labels: no tedious setup, difficult-to-load materials or wasted labels! It's unbelievably easy - the way label making should be. No calibration or wasted labels - the printer "reads" your cartridges and then automatically sets up the label correctly in your Brady software. Label materials for safety & arc flash, wire & panel, pipe markers, 5S, general die cut, production line facility, rating plates and circuit boards. Polyimide & static disappative labeling. Labels: Supplied in cartridge, drops into place, 15-sec changeover. Ribbon: Supplied in cartridge, snaps into place, 5-sec changeover. Extremely aggressive 8-10 year outdoor vinyl with high tack and chemical resistance, plus wash down material, reflective, 10-hour glow-in-the-dark, engraved plate substitute, 33 other materials. Does the Brady BBP 33-C Label Printer cut the labels to a custom size? Yes, the Brady BBP 33-C Label Printer can be programmed to whatever size you require, and will cut the backing paper between each label to size. Where can I buy the Brady BBP33-C 129961 Label Printer with Auto Cutter? 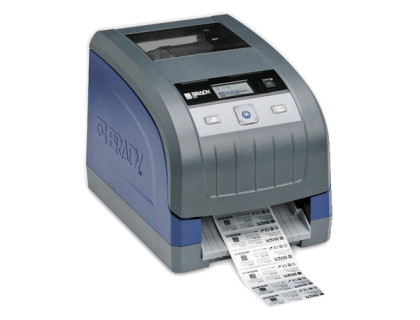 You can buy the Brady BBP 33-C Label Printer by clicking on the link above, or from sites like Megadepot and Amazon. What are some Brady BBP33-C 129961 Label Printer with Auto Cutter alternatives?